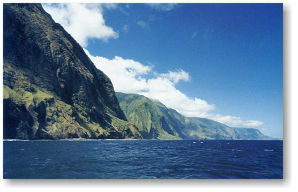 Along the entire South side of the island of Molokai lies the longest fringing reef in Hawaii. Seldom visited by divers, this natural sanctuary offers some of the best diving and snorkeling in the islands. Pristine waters that team with wildlife including several species of rare fish and coral. Green sea turtles, rays, several types of sharks and colorful reef fish abound, as well as the numerous whales during the winter months. Diving on Molokai is exceptional because of the vast amount of reef that can be found on our Southern shore. 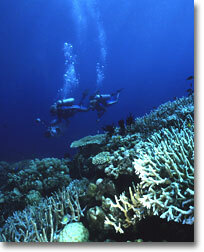 The reef is truely pristine and unspoiled. Based on weather and water conditions and the wishes of our guests, each trip is organized to provide the best possible dive experience. We have over 40 spectacular two tank sites to visit - like the reef wall at Pala'au or one of seven blue holes found off our shores. 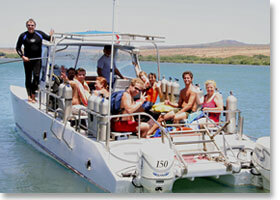 Don't miss the opportunity to explore one of Molokai's hidden dive locations. You can be among the select few who ever visit these exhilarating destinations. Whether you choose the mysterious Moku Ho'oniki, a calm day on Molokai's famed "backside" or a beautiful reef tour, these 3-tank, deep dives will be forever etched in your favorite memories.